Anaerobic metabolism is a natural part of whole-body metabolic energy expenditure. Fast twitch muscle (as compared to slow twitch muscle) operates using anaerobic metabolic systems, such that any recruitment of fast twitch muscle fibers leads to increased anaerobic energy expenditure. Intense exercise lasting upwards of about four minutes (e.g., a mile race) may still have a considerable anaerobic energy expenditure component. High-intensity interval training, although based on aerobic exercises like running, cycling and rowing, effectively becomes anaerobic when performed in excess of 90% maximum heart rate. 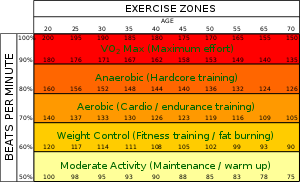 Anaerobic energy expenditure is difficult to accurately quantify, although several reasonable methods to estimate the anaerobic component to exercise are available. In contrast, aerobic exercise includes lower intensity activities performed for longer periods of time. Activities such as walking, long slow runs, rowing, and cycling require a great deal of oxygen to generate the energy needed for prolonged exercise (i.e., aerobic energy expenditure). In sports which require repeated short bursts of exercise however, the anaerobic system enables muscles to recover for the next burst. Therefore, training for many sports demands that both energy producing systems be developed. The two types of anaerobic energy systems are: 1) high energy phosphates, adenosine triphosphate and creatine phosphate; and 2) anaerobic glycolysis. The former is called alactic anaerobic and the latter lactic anaerobic system. High energy phosphates are stored in limited quantities within muscle cells. Anaerobic glycolysis exclusively uses glucose (and glycogen) as a fuel in the absence of oxygen, or more specifically when ATP is needed at rates that exceed those provided by aerobic metabolism. The consequence of such rapid glucose breakdown is the formation of lactic acid (or more appropriately, its conjugate base lactate at biological pH levels). Physical activities that last up to about thirty seconds rely primarily on the former, ATP-CP phosphagen system. Beyond this time both aerobic and anaerobic glycolysis-based metabolic systems begin to predominate. The by-product of anaerobic glycolysis, lactate, has traditionally been thought to be detrimental to muscle function. However, this appears likely only when lactate levels are very high. Elevated lactate levels are only one of many changes that occur within and around muscle cells during intense exercise that can lead to fatigue. Fatigue, that is muscle failure, is a complex subject. Elevated muscle and blood lactate concentrations are a natural consequence of any physical exertion. The effectiveness of anaerobic activity can be improved through training. ^ a b Medbo, JI; Mohn, AC; Tabata, I; Bahr, R; Vaage, O; Sejersted, OM (January 1988). "Anaerobic capacity determined by maximal accumulated O2 deficit". Journal of Applied Physiology. 64 (1): 50–60. doi:10.1152/jappl.1988.64.1.50. PMID 3356666. Retrieved 14 May 2011. ^ Scott, Christopher B (June 2005). "Contribution of anaerobic energy expenditure to whole body thermogenesis". Nutrition & Metabolism. 14. 2: 14. doi:10.1186/1743-7075-2-14. PMID 15958171. Retrieved 14 May 2011. ^ Di Prampero, PE; G. Ferretti (Dec 1, 1999). "The energetics of anaerobic muscle metabolism" (PDF). Respiration Physiology. 118 (2–3): 103–115. CiteSeerX 10.1.1.610.7457. doi:10.1016/s0034-5687(99)00083-3. Archived from the original (PDF) on 2011-07-27. ^ Scott, Christopher B (2008). A Primer for the Exercise and Nutrition Sciences: Thermodynamics, Bioenergetics, Metabolism. Humana Press. p. 166. ISBN 978-1-60327-382-4. ^ Robert Donatelli, Sports-specific Rehabilitation, p. 40, Elsevier, 2007 ISBN 0443066426. ^ Westerblad, Håkan (1 February 2002). "Muscle Fatigue: Lactic Acid or Inorganic Phosphate the Major Cause?". Physiology. 17 (1): 17–21. doi:10.1152/physiologyonline.2002.17.1.17. Retrieved 25 September 2017. ^ McMahon, Thomas A (1984). Muscles, Reflexes, and Locomotion. Princeton University Press. pp. 37–51. ISBN 978-0-691-02376-2.